No one has ever awakened in the middle of the night anxious about ecclesiology per se (225). In this, my final post on Paul Zahl’s Grace in Practice: A Theology for Everyday Life, I will focus on Zahl’s ecclesiology, or rather, his non-ecclesiology. I raise this aspect of Zahl’s thought because, at least in my view, it stands against the flow of current trends. Just as ecclesiology seems to be all the rage, we have in Paul Zahl a resounding indifference. I have no ecclesiology. ‘Ecclesiology’ is a word that means doctrine of the church. An ‘ecclesiology’ is a teaching or concept concerning the Christian church: what it is, what it consists of, what is important in it, and how it relates to other ideas about the church. When I say, ‘I have no ecclesiology,’ I am not really saying that. I am simply saying that ‘ecclesiology’ is unimportant to me. It is low on my list of theological values (225). “In life there are two governing principles that are at war with one another. The first is law; the second is grace…. The law crushes the human spirit; grace lifts it” (1). “Law is hell on earth. It is rigidly fixed as the lot of every person who has ever lived. Grace, on the other hand, is what everyone desires. One-way love is the object of all human craving” (80). For my third post on Paul Zahl’s Grace in Practice: A Theology for Everyday Life I here lift up a few quotations from Zahl that I believe capture the essence of his “theology for everyday life” with respect to law and grace. I will allow Zahl to speak for himself, but as you read these quotations do keep in mind that Zahl is attempting to capture an accurate description of “how Christianity works” (27) on the plain of human experience. I have found these insights regarding law and grace to be both theologically challenging and homiletically helpful. All emphasis is Zahl’s. For me personally, my appreciation of this blog begins prior to joining on. This blog, along with some others (here are twoexamples) were extremely important to me as I began to focus more seriously on theology. For a variety of reasons, I've always felt like I was behind in my understanding of theology, and DET provided current snapshots and facilitated discussions. This was invaluable for me. Though I rarely commented, for nearly the duration of my more serious study of theology I've kept an eye on what was going on here. Lately I’ve been reading fellow theo-blogger Jason Goroncy’s book Hallowed Be Thy Name: The Sanctification of All in the Soteriology of P. T. Forsyth. A proper review will be published in due course, but in the meantime, I thought that I would let you all in on an interesting paragraph that I found. This paragraph deals with the state of British evangelicalism in the 19th century vis-à-vis the related questions of hell, annihilation, and universalism. I find this passage particularly fascinating because the pendulum seems to have swung soundly in the opposite direction in contemporary North American evangelicalism. It was less than a decade ago, for instance, that one evangelical denomination replaced vague language about “eternal judgment” with the much more concrete phrase “eternal conscious torment.” So what Goroncy has to tell us here may lend some much needed perspective. Jason Goroncy, Hallowed Be Thy Name (Bloomsbury T&T Clark, 2013), 180–81. As usual, bold is mine. Karl Barth, Epistle to the Romans, 516–17. Bold is mine; caps are Barth’s. This spring I graduated from seminary and this fall I will begin a doctoral program. The in-between time has been good for revisiting – and interrogating – some of the intellectual sources I brought to seminary. In my initial post on Paul Zahl’s Grace in Practice, I indicated that I would like to devote this second one to the anthropological starting point of his “theology of everyday life.” I raise this topic because I believe that Zahl’s Grace in Practice may provide a way toward reconciling the theologies of Friedrich Schleiermacher and Karl Barth, especially with respect to dogmatic organization and the role of experience in theology. Zahl does not explicitly make this case, but I do think that his theology opens up such a possibility. A full treatment of this topic could hardly be contained within a blog post. My hope here, then, is simply to highlight a few salient issues and show how Zahl might offer a way forward. With that, let’s now set up the problem that Zahl might help to resolve. I feel like skipping the intro to this thing today. So, on with the links! Helmut Gollwitzer is no doubt becoming much better known to DET readers. One more installment can’t hurt, eh? This is from a sermon of Gollwitzer’s on December 11, 1977. In it he imagines what a newspaper headline addressing the events of Acts 12.1–17 might look like if put into contemporary (to him, although in many ways it still rings true) language. Please forgive some translation infelicities, as I’m only reproducing it as the volume does. Helmut Gollwitzer, The Way to Life: Sermons in a Time of World Crisis (T&T Clark, 1981), 84. Mysterious liberation of prisoner in Jerusalem! Legal Authorities investigate prison scandal. Alright, maybe not the most recent. But a fairly recent one nonetheless. The International Journal of Systematic Theology has published a review that I wrote for them of Keith Johnson’s book, Karl Barth and the Analogia Entis. I’ve written about this book at DET before, a number of times. IJST has had this review in its pocket for a while now – so long, in fact, that the review stills lists my PTS affiliation rather than LU – so I’m very glad that it is finally out. You can access the review online if you have the right permissions. Otherwise, look for it in your local theological library. John Calvin, Tracts and Letters, 5.278-79. One of the facets of Calvin’s work that receives the least attention was his letter-writing to those under sentence – or at least threat – of execution for their Protestant convictions. While France was always eager to support Protestants in Switzerland and the Holy Roman Empire, for political reasons, its regime could tend to be fairly vicious in the persecution of Protestants within its own borders. If those imperiled or imprisoned were known to Calvin or any of Calvin’s friends, or even if Calvin got word that they had read some of his work appreciatively, he made it a point to write to them. So for instance, he begins a letter from July 1550 as follows: “Although we have been unknown to each other by sight, yet since you recognize the Master Christ in my ministry, and submit yourself cheerfully and calmly to his teaching, this is a sufficient reason why I should, on the other hand, esteem you as a brother and fellow-disciple” (278). 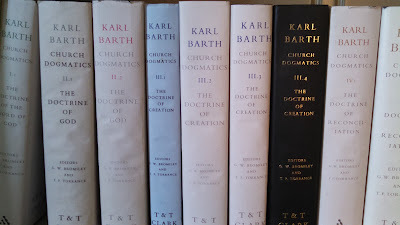 In the introduction to his Homiletics, Karl Barth says, “theology as a church discipline ought in all its branches to be nothing other than sermon preparation in the broadest sense” (17). In that spirit, my church’s preaching team began meeting weekly to discuss three things: last Sunday’s sermon, next Sunday’s Scripture passage, and finally, a book we are all reading together. For July’s Book o’ the Month, I’d like to introduce the readers here at DET to one of those books, namely, Paul Zahl’s Grace in Practice. I want to share this with you because it has been one of the most challenging, formative, and helpful books that our group has read since we first started meeting about a year and a half ago. It has especially helped to shape how we think about the experience of grace and how the sermon may be a vehicle for that experience.